Furosemide for dogs is a diuretic which is prescribed to eliminate the retention of fluid, and this can be a symptom of congestive heart failure, a number of kidney diseases and conditions, and other medical problems as well. If the dog illness diagnosis for your pet includes any disorder or disease which could cause your pet to accumulate excessive fluid in tissues then a diuretic may be prescribed to take care of this. Furosemide for dogs is usually prescribed in a dosage of between one and two milligrams per pound of body weight, given either once or twice a day, depending on the severity of the fluid retention and underlying condition. A urinary tract infection in dogs who are on Furosemide is not that common, because the drug increases the amount of urine produced and will cause your pet to need more frequent bathroom trips. Urine may not be retained in the bladder or kidneys for very long, so bacteria do not get a chance to grow. Furosemide for dogs can have a number of possible side effects, some which are minor and some that may be severe. You should also make sure that there is always fresh water available for your pet, and this is true for Doxycycline for dogs and most other medications as well. Furosemide for dogs should not be used if your pet has diabetes, if the dog is pregnant or nursing, if certain other medications are being taken or in several other circumstances. Your vet may require testing periodically to check organ function and ensure that the drug is working properly. 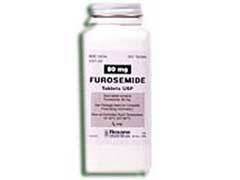 Unlike Baytril for dogs and other short term medications, Furosemide is usually prescribed on a long term basis. This usually means monitoring the dog to ensure that there are no adverse effects, and that the medication and dosage are both still appropriate.